Boosted fish populations and a platypus sighting were some of the highlights of environmental watering in the Loddon system in 2014–15. Phil Slessar, Project Officer with the North Central Catchment Management Authority, said fish monitoring was showing an increase in some native fish species in response to environmental water releases. "In surveys from the last two years, Murray–Darling rainbowfish have been caught in the Loddon River between Laanecoorie Reservoir and Loddon Weir, with numbers gradually increasing over that period," Phil said. "They were caught downstream, in the reach of the river between the Loddon Weir and Kerang Weir, for the first time in 2014–15. This is one of the southern-most areas of rainbowfish distribution in the Murray–Darling Basin." "A bony bream was also caught in the stretch of river downstream of the Macrona channel. Bony bream are rarely seen in the Loddon." One of the highlights of the year was the sighting of a female platypus at Baringhup during a field survey in February 2015. "Her presence during the day indicated that she had young and her behaviour indicated that she was foraging for food around the snags in the river," Phil said. Lake Yando and Lake Meran received environmental water in 2014–15. During the watering at Lake Yando over 60 species of birds (including 36 species of waterbirds) were observed and five species of rare plants were identified. Lake Meran, meanwhile, received a top up of 2,000 ML to support habitat and create foraging opportunities for waterbirds, and to maintain the health of the 'intermittent swampy woodland' which is depleted in the region. 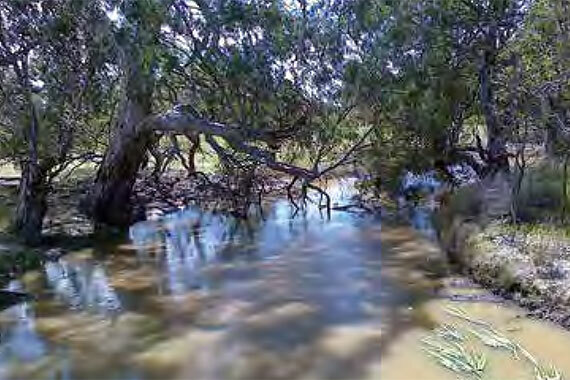 Birch's Creek received a three-day flush in April 2015 to improve connectivity between pools, enhance water quality to support river blackfish and platypus populations, and water vegetation lower on the banks.